Off-topic: Get down, get fuzzy, Tianyulong! That clanking sound you just heard was pretty much the entire field of paleontology evolutionary biology wired humanity dropping a solid gold brick: Tianyulong, a basal ornithischian from (where else?) China, has been found with dino-fuzz (Zheng et al. 2009). Not exactly protofeathers, but pretty darn similar. And if they’re in theropods and ornithischians, they were probably primitive for Dinosauria (at least; comparisons of these integumentary structures to pterosaur ‘hair’ are probably coming). It’s certainly possible that the common ancestor of Ornithodira (the pterosaurs+dinosaurs clade, which encompasses most non-croc-line archosaurs) was fuzzy. (So much for the “fact” that we “know” that small dinosaurs couldn’t have been endotherms because of their naked skin–see, e.g., pretty much everything ever written by Feduccia, Ruben, and the rest of the BANDits [Birds Are Not Dinosaurs cultists]). It’s true that we have skin impressions from many dinosaurs that show scaly skin, so if dino-fuzz was primitive for dinosaurs it must have been lost, or had a restricted distribution on the body (like a midline crest), or been ontogenetically transient (possibly present only in babies) in many taxa. If there were any shaggy sauropod skin impressions out there, we’d really, RE-hee-huh-HEEELLY like to know. So far, zip. Even the skin impressions from the Argentinian sauropod embryos show bare, scaly skin (Chiappe et al. 1998). Still, those skin patches don’t cover the entire embryo. We can’t rule out some fuzz even in the Argentinian embryos, and except for a scrap of bone shard of excellence here and there (Britt and Naylor 1994), sauropod embryos and their skin are otherwise ridiculously unknown to our planet. So we can dream, for a while longer anyway. 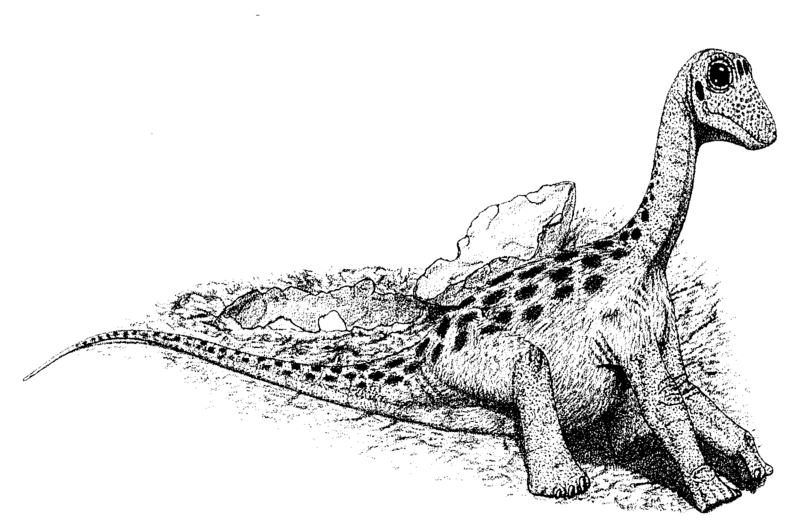 Back in 1994, Greg Paul drew a hatchling sauropod with dino-fuzz (Paul 1994:fig. 15.3, above), and we’re bringing it back in honor of Tianyulong. Here’s your obligatory sauropod vert shot for this post. Tremble as the ancient, bloated hulk looms out of the mists of deathless time, like an ageworn stone idol or some eldritch Lovecraftian horror! Oh, and behind Mike you can just make out the AMNH Brontosaurus (yeah, we know, we’d like to bring that back, too). James O’Donoghue wrote a piece for New Scientist on sauropod gigantism, which you can read for free here. He kindly cited my work on air sacs, and even more kindly threw in a link to an SV-POW! post, which I’ll let you find for yourself. Now that I’m sending you there, the hyperlink circle is complete. Two great things came in the mail yesterday, but those will be subjects of future posts. Stay tuned, true believers! Britt, B.B., and Naylor, B.G. 1994. An embryonic Camarasaurus (Dinosauria, Sauropoda) from the Upper Jurassic Morrison Formation (Dry Mesa Quarry, Colorado); pp. 256-264 in Carpenter, K., Hirsch K.F., and Horner, J.R. (eds), Dinosaur Eggs and Babies. Cambridge University Press, Cambridge. Chiappe, L. M., Coria, R. A., Dingus, L., Jackson, F., Chinsamy, A., and Fox, M. 1998. Sauropod dinosaur embryos from the Late Cretaceous of Patagonia. Nature 396: 258–261. Paul, G.S. 1994. Dinosaur reproduction in the fast lane: implications for size, success, and extinction; pp. 244-255 in Carpenter, K., Hirsch K.F., and Horner, J.R. (eds), Dinosaur Eggs and Babies. Cambridge University Press, Cambridge. Zheng, X.-T., You, H.-L., Xu, X., and Dong, Z.-M. 2009. 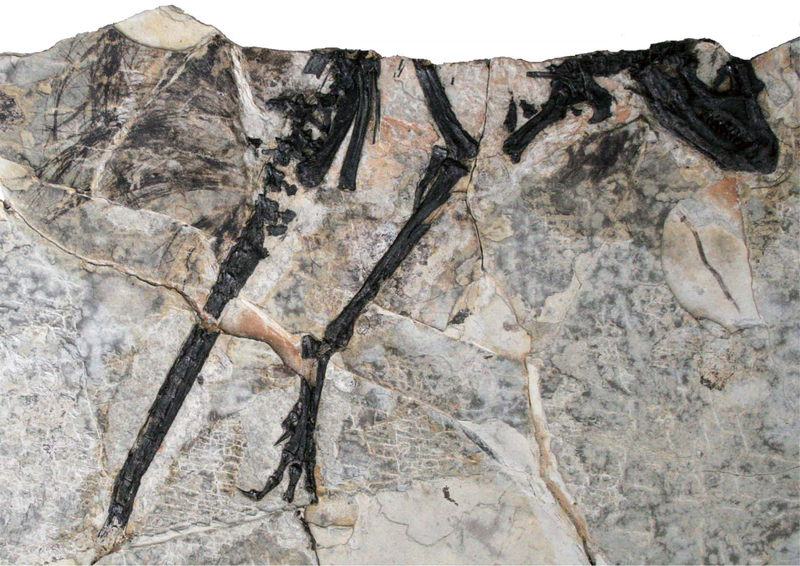 An Early Cretaceous heterodontosaurid dinosaur with filamentous integumentary structures. Nature 458:333-336. Just tell me when Schleich will stop painting front toenails on all their sauropod figures. Or retire the Quetzalcoatlus with the pelican neck (“New Sept. 2009!”). Or rotate their theropod manus(eses) to face medially. Or point the Stegosaurus thagomizer spikes laterally. I can’t seem to spot the fuzz on the Paul drawing. Clue? And, who did the reconstruction at top? Oh, man. I wish I had a dollar for every time I’ve heard that joke. Matt, why did you call this Brontosaurus? 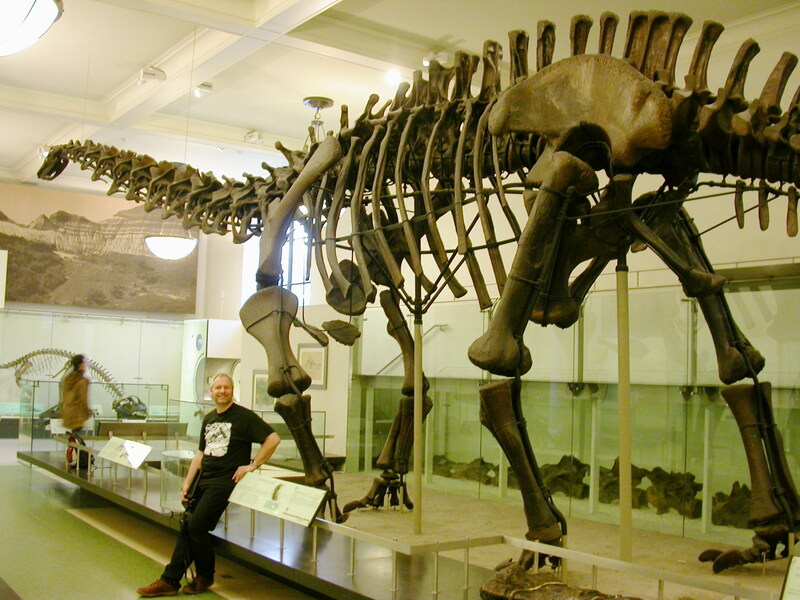 If our reason for thinking Bronto is generically distinct from Apato is legitimate, then on the basis of that character the AMNH mount would definitely be Apato. Brontosaurus is what Fred Flintstone barbequed. He wasn’t too picky about genus. Wow!! I am on a field course in Arizona and just checked the web. Wow!! Let’s got get ahead of things Thom! Though obviously given my branch of research that would add a certain bit of spice to the ornithodiran hypothesis. I’ve actually known about this thing for over a year and boy has it been hard to keep quiet. Enjoy it people! It’s oddly a lot easier to see in the small version of the illo rather than the full-size click-through version. The neck and limbs are bare but you can just make out what looks like downy hair all over the torso. According to the National Geographic story, it is by Li-Da Xing. It’s nice work, too. Matt, why did you call this Brontosaurus? Not for any scientific reason. There is just something about that particular skeleton that screams Brontosaurus to me. I don’t get that vibe from the Pittsburgh or Chicago apatosaurs. Probably some echo of my lost youth, when that skeleton WAS Brontosaurus in about every dinosaur book leftover from the 60s and 70s. Thanks, Matt, I had taken that for stippling/half-toning. While we’re off topic, I’d like to take the opportunity to present new photographic evidence supporting the chelonian trans-continental boreitropic phorusrhacid transport hypothesis: http://www.pixdaus.com/single.php?id=137567 . This in addition to the example from Mary Poppins telegraphed in http://2.bp.blogspot.com/_QdHn8FT7SdY/R7oZ5Xfg7AI/AAAAAAAABF0/a_AdZkGxsjI/s1600-h/river1sm.jpg . of chelonians transporting a (potential) breeding pair of a biped species of mass and size similar to the phorusrhacids’. Since Psittacosaurus had a mane of quills on its tail, and it looks like Tianyulong had quills along its back, I wonder if sauropods could have had a mane of quills along their large necks, like a horse or giraffe? I wonder if sauropods could have had a mane of quills along their large necks, like a horse or giraffe? If they did, it would have been very metal. The first meeting of the Society to Equip Horses and Giraffes with Quills is on Tuesday. With dorsal AND ventral squamation, Tom? Not sure…. Lewisuchus from Las Chanares at least has dorsal midline scales, and this may impair some basal saurischians from having the structure IF it’s basal to Dinosauromorpha. If feathers or ‘hair’ were basal for dinosaurs, will we one day find a woolly mammoth-like sauropod? What are the most southerly/northerly sauropods found so far? Never mind the woolly mammoth sauropod. I’m watching out for the chinchilla sauropod. Er. Maybe I’m mis-interpreting the perspective of the photo, but it looks to me like most of the Apatosaurus (all but the head and neck) is in front of Mike. You like the name Brontosaurus??? What’s wrong with Brontosaurus? Is it just that it’s synonymized, or was there something else wrong with the name? Synonymized names need love too. Of course we like the name Brontosaurus — it’s one of the classic sauropod names. Ah, if only there were more sauropods with Bronto- names. But what can one do? Try to find out if adult B. excelsus is really all that different from juvenile A. ajax without invoking the wrath of DID (“differences in ontogeny”) or TJ SpeVa (“that’s just specific variation!”). Bakker’s reasons are of course based on comparison of a distorted skull he infers to belong to the holotype of excelsus and to a referred skull for ?louisae, which begs some mighty massive intakes of breath. I’d love to split off the seeming highly specious genera of the Morrison due to nothing more than my GAR relfex (“Genera are relative”), but unfortunately, I must err on the side of caution — I really have no idea what a genus is … or a species, rather, and how to tell the difference in a fossil save on a cladogram where it can’t group with similar fossils explicitly. That’s a test few will stand behind, as it is relative to the analysis, sooooo…. So … there’s a chance Brontosaurus will become a valid genus again? AWESOME!